In addition to being named on the top 10 list in Fast Company's Most Innovative Architecture Companies (the only LA on the list) and the major success of the High Line, a couple of recent wins have pushed James Corner Field Operations fully from the realm of the theoretical provocateur, to competition all-star to full-fledged big name landscape architecture project powerhouse. The Fast Company article included the likes of DS+R, MVRDV, Kieran Timberlake, and Santiago Caltrava, and mentioned the firms most visible work to date: "James Corner's New York-based landscape architecture firm led the design team that transformed the High Line, an abandoned elevated railway track on Manhattan's west side, into a wildly successful public park. 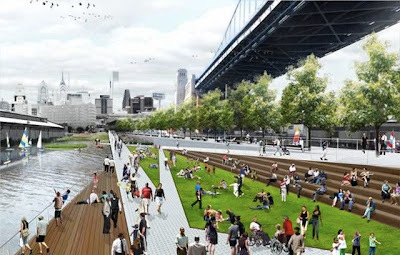 Up next: revitalizing Philadelphia's Race Street Pier." 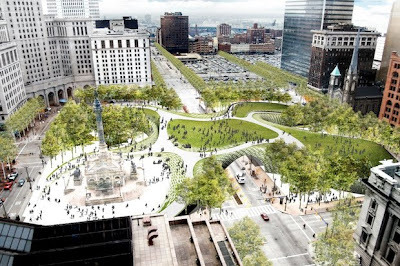 In addition, there has been copious press related to Field Operations' design proposals for Cleveland's Public Square. 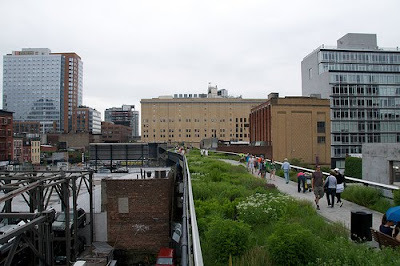 As mentioned on Design Under Sky: "James Corner, of Field Operations and High Line Park fame have worked directly with two nonprofit organizations, Parkworks and the Downtown Cleveland Alliance. Corner offers three radically different designs to the square. Deemed, The Frame, The Forest, and The Thread, the concepts address traffic and circulation matters to different extremes, while all providing elements of urban park goodiness." Two recent additions to the portfolio, spotted via World Landscape Architect, announce some more high-profile commissions for Atlanta and Santa Monica. 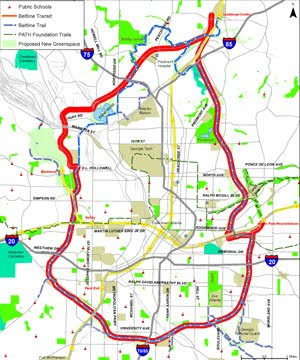 The first includes design for the 22-mile Atlanta Beltway, which, according to The Dirt, Field Operations and "...Perkins+Will have been selected as the lead designers of the Atlanta Beltline, a 22-mile green beltway of park networks, multi-use trails and light rail, which will also reuse and revitalize old rail tracks and restore local ecosystems. " The last is annoucement from the LA Times that Field Operations "...has prevailed in a high-powered design competition for a 7-acre park in the heart of the Santa Monica Civic Center". An interesting addition is the makeup of some of the teams, which included some big name architecture firms. "Of the six competitors for the park job, Field Operations was the only one without an architecture firm attached. It beat out entrants including Frank Gehry and a team made up of landscape architect Peter Walker and architect Frederick Fisher." The trend towards high-profile park design featuring architects may begin to change as some high-profile LA firms gain the credibility to go it alone. And to show that the firm isn't doing quite everything in the US, and are maybe a bit busy with the current workload - Field Operations was conspicuously absent from the list of finalists for the St. Louis Gateway Arch Design competition, leaving room for a number of other high-profile LAs as team leads or team members. This who's who of designers in St. Louis should produce some interesting ideas and inevitably a great concept, but I really think competitions that don't rely on great ideas submitted in anonymity - such as this one with an open qualifications process that made it easy to pick the big names - limit opportunities for any new faces to appear. It's less a competition than a high-profile RFQ. Isn't the competition a chance for the new rising stars to shine? Instead of reinforcing the current roster of stars that get visible and notable work worldwide, how about using the competition for tapping into potential. If big firms when - they do so on merit of ideas, not just reputation. Just look what that model did for Field Operations in the first place?